Funerals are not the most popular topic of discussion and, more often than not, it&apos;s not something we talk about until the unfortunate need arises. When planning a funeral, the flowers play an important role in honouring the memory of the loved one we lost. Funeral flowers like funeral crosses make lovely tributes and can be set on the casket, at the grave site or displayed in just about any way you see fit. They also make thoughtful sympathy flowers if you are looking to send flowers to somebody who as lost somebody close to them. After carefully and professionally arranging your floral cross, our florists will be happy to send the flower delivery directly to the funeral home or wherever you need in order to make your life easier during this difficult time. Our best selling funeral cross tribute in shades of pink, purple & red. A luxurious sympathy tribute. 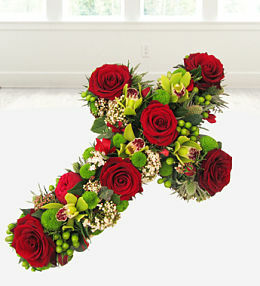 Funeral cross delivery in the UK with prestige flowers. 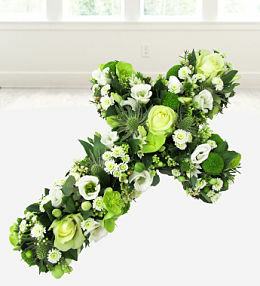 Our funeral crosses are all hand delivered by our uk florists.